I was talking to my therapist about how the last time I updated my website I was really happy with the work I had but wanted to go out and take more pictures. She was very encouraging (she definitely loves creative people and I missed being creative). I had an interesting therapy session this afternoon, I talked about a few other things but I told her how I actually miss photographing and editing photos to how I see them. She was very cool when she said, “I think you should go out there and do it.” So, I did. I don’t like being alone when I go out exploring, but this time I wanted to be alone. I wanted to take my time at each spot. The only thing that preoccupied me was the fact I didn’t carry enough change for my meter, but I was okay with it. I was happy about it because I wanted only a certain time to take pictures. I took over 300 pictures. Lots of continuous shots, but I took so many. 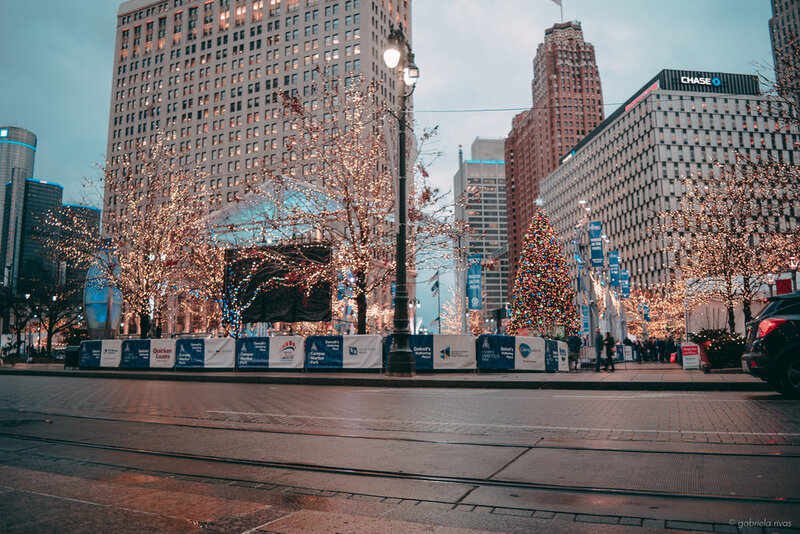 It’s Small Business Saturday and so many people were in Downtown in general because of Campus Martius and the winter festivities (though, we still have 3 weeks until it’s officially winter). It was nice to people watch by myself. My therapist asked me if I’ve come out of my turtle shell more and I told her that I sort of am and I’m doing it the way I want to. Do I miss going out for drinks, though, at my favorite bar? Yeah, but I also never spent much time by myself doing what I like. Whenever I’m with people and I’m taking pictures, it’s usually because we’re on our way to a destination and I don’t have time to really explore and feel the space. Tonight, I did. I’ve lived in Detroit for forever but I don’t always give myself the chance to just enjoy it by myself. It’s not because I dislike it, it’s just that I’m lazy and being in a huge sea of people gives me social anxiety. But, I’m glad I did something for me. Even if it was brief. It’s filling that creative void I miss when I don’t have a solid drawing idea… which I do actually have one. I told therapist about it and she told me I should just do it. Maybe skulls are my niche and I just need to learn to accept that about myself. Hell… you learn something new every day. It Doesn't Hurt To Reflect... Right?